The problem with a series about building on an island is that, sooner or later, you're going to run out of island. Previous Tropico games could, at times, feel pretty limiting. Not only were you surrounded on all sides by clear blue ocean, but even within your verdant, tropical paradise, mountains and cliffs would often restrict your ability to expand. Not so in Tropico 6. In many ways this sequel will be familiar to Tropico fans, despite it having a new developer—Might & Magic's Limbic Entertainment—at the helm. But for all that's the same, a few new features should help alleviate any claustrophobia. "We figured for El Presidente, one island wasn't enough," says lead level designer Mark Mussler, "so we wanted to provide him with a bigger playground to operate in." Each mission will now take place on an archipelago—with one main landmass surrounded by smaller satellite islands. "It perfectly fit into the Tropico theme because it underlines this tropical Caribbean atmosphere," says Mussler. "But of course we also wanted to ensure we gave the player meaningful ways to engage with the archipelagos and new islands." This is primarily achieved through resource distribution. In one of the maps I'm shown, certain resources like iron and gold are limited to a satellite island, forcing players to create mines far away from their main settlement. As in previous games, each Tropican is simulated, and so they won't just magically appear in the place you need them to be. That means you need to connect your islands together, either physically, through bridges, or by providing public transport. By building a landing dock and teamster port, citizens will be able to take boats between islands, and resources can easily be transported to your main dock. In Tropico 6, however, the simulation is being pushed further than ever. In Tropico 5, workers had a permanent effect on the production output of their workplace, even if they were weren't physically in the building. Here, though, workers will clock in and out of their job, and the productivity of each building will reflect that. "Production buildings will only operate when workers are on site," says Mussler. "That's why it's so important, especially in Tropico 6 with the archipelagos, to ensure that travel times are as short and efficient as possible." Efficiency has always been an element of the Tropico series to an extent. I've spent many hours in previous games waiting for construction crews to reach the site of my next development project. But, with satellite islands forcing Tropicans to travel longer distances, developing good infrastructure is more important than ever. Even if you connect all of your islands with bridges, only the richest Tropicans are able to run cars—unless you spend $1,000 per month on the Free Wheels edict. If you're not prepared to do that you can build bus stations instead, but it'll be on you to create routes that will get your workers where they need to go. In a mission I played in the beta build, I found it more useful to grow small communities around key businesses on satellite islands. Away from the main city, a small logging settlement emerged, focused on felling trees and turning the logs into planks that could be exported. The businesses required workers, which meant building houses, and the residents required services and entertainment, which meant more businesses. It's not a major new direction for the series, but I enjoyed creating these specialised ad-hoc communities. Many of Tropico 6's new features are simple in nature, but let you make the most of the space available on each map. Tunnels, for instance, let you extend roads through mountains—reaching otherwise inaccessible parts of the map. And teleferics can transport Tropicans up to hills and plateaus, letting you build at different elevations. Not all options will be available at the start of each mission, though. As in Tropico 5, you'll need to progress through different eras—from the colonial era to modern day—with new building options, edicts and research unlocking as you progress. And even when you've hit the relevant time period, you'll need to spend money to unlock blueprints for more advanced buildings. 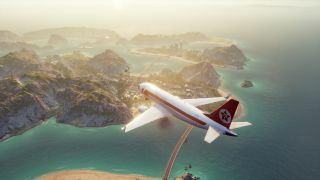 Tropico 6 will launch with 15 story missions, and each mission map can also be played in sandbox mode (on top of a further 15 maps exclusively designed for sandbox play). Based on what I've seen, each seems to have some interesting wrinkle designed to make you engage with various systems. In one mission I'm shown, titled Bureaucracy, various edicts are randomly activated by the AI. This forces players to react to the consequences of political decisions made outside of your control—be it loss of faction standing, additional expense, or, to pick a specific example, the loss of productivity that results from enforced siestas. Another mission sees El Presidente attempt a grand experiment to create a city free of houses—forcing citizens to live in tents and shacks. There's no great story to the campaign—it's an anthology of absurd scenarios, filtered through the series' typical broad, politically charged humour, but the best seem designed specifically to subvert the city-building genre in fun ways. Even in sandbox modes, the design of the archipelagos will force players to get creative at times. Many will be missing vital resources, requiring you to source them from elsewhere. This can be done in a number of ways, either through trading, or via the new raid system. Create a raid building—such as a pirate cove—and you'll be able to spend raid points to send a crew out on missions to steal the things you need. You can loot a variety of raw materials, or even send out a rescue party to gather new citizens. Raid buildings also let you trigger a heist—an ongoing mission to steal world wonders from other nations. "When you activate a heist it basically unlocks a quest that the player needs to fulfil in order to ensure that the people you send out to steal the buildings can actually achieve it," explains Mussler. "It does take a while to accomplish that, but the thing with world wonders is they're not just a gimmicky thing that look cool." Mussler's island, for instance, is the new home of Saint Basil's Cathedral, which used to live in Moscow. Its bonus means that whenever a citizen gains or loses faith happiness, their other happiness aspects are all affected by the same amount. In practice, it means, as long as Saint Basil owners focus on giving Tropicans access to churches and cathedrals, and fulfil requests made by the religious faction leader, they can mitigate the happiness penalties that occur for poor food quality, high crime or insufficient healthcare. Each wonder offers a different bonus. The Statue of Liberty, for example, ensures that all tourists arrive with 100% happiness and in full support of El Presidente—a boon that I'm not sure is shared with its real life counterpart. The Great Pyramid of Giza, meanwhile, increases the construction rate of each worker. Presumably the countries that used to own these wonders will have something to say about their removal, but that's all part of the fun of Tropico's geopolitical tensions. In addition to having to placate various political faction leaders and superpowers, as well as your own citizens, El Presidente can, once again, go into business for himself—siphoning off money and diverting it into his Swiss bank account. This is something I've always wanted to see expanded in a Tropico game—the series is great at offering ways to abuse your power, but hasn't always provided a good reason to do so. In Tropico 6, though, your Swiss money can be given to a broker in exchange for a variety of favours. If you're about to lose an election, for example, you can pay your broker to launch an image campaign. "When elections come up, and if you identify you're not doing well, this is a short term thing," says Mussler. "It won't help you in the long run but at least it can get you past an election." The broker can also be used to effectively cancel a political faction request without suffering a reputation penalty. Beyond these specifics, though, you can also exchange Swiss money for resources—either research, cash, raid points or new immigrants. Ultimately, Tropico 6 doesn't feel like a revolutionary new direction for the series. Instead, it's positioning itself as a definitive version—reintroducing elements removed from Tropico 5 such as election speeches and work modes, as well as tweaking and expanding key systems to offer more options and new ways to define how you want to play. But, while never groundbreaking, having a larger canvas to create on—and the infrastructural additions that archipelagoes provide—does make a difference. Will it be enough to make Tropico 6 a must play? Limbic is hoping you'll vote yes.